Try a few of our beautiful little pastel layer cakes and be sure to make all your spring time occasions more memorable and special. A new spring tradition has arrived with these dainty little layer cakes. Adorned with white chocolate flowers, this delicious assortment of 36 moist bite-size spring confections are made with freshly milled almond paste and sweet butter for a rich and glorious taste sensation. Perfect for a Wedding or Baby Shower, Springtime tea social, or a wonderful gift for Mom on her special day! For your enjoyment we have included the following varieties: Apricot, Truffle, Strawberry, and Lemon. 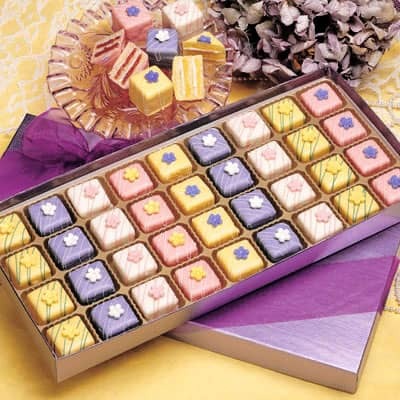 FREE SHIPPING on your second and third boxes of Petits Fours going to the same address. So buy more and save on shipping.